You may find this hard to believe, but Great Smoky Mountain National Park (GSMNP) receives more visitors every year than any other national park in the entire United States. According to the National Park Service, GSMNP receives a whopping 9.4 million visits every year. That number far surpasses the Grand Canyon, which falls in the number 2 spot at 4.6 million annual visits. In other words, Great Smoky Mountain National Park receives more than double the number of visitors of the Grand Canyon, every single year. That huge difference honestly floored me! Now, obviously mountains are beautiful and hiking is fun. We all know that. But, just what is it about the Smokies that attracts so many foreign and domestic travelers every single year? Let’s take a look at the top 10 reasons GSMNP is the most visited national park. 1. The location – The park is within a 1 day driving distance for a large portion of United States citizens. I am counting a day long drive as 12 driving hours or less. This 12 hours does not account for stopping and traffic, but highly motivated, able bodied individuals can easily make such a drive without having to include a mid-route overnight stay. The drive time is around 12 hours from places such as Connecticut, Florida, Kansas and Oklahoma. People who live in and around major hubs like Washington DC, Detroit, Chicago, New Orleans, Orlando and Tampa can reach the park in 9 hours or less. 2 . The views – With many scenic driving routes and overlooks, it’s hard to avoid an amazing view when you are driving around in the Smokies. With its array of vibrant colors, fall is one of the most popular time for scenic drives. Although all roads in the park offer natural beauty, designated scenic driving loops include Cades Cove Loop Road, Cataloochee Valley, Newfound Gap Road, Roaring Fork Motor Nature Trail and Upper Tremont Road. Of those driving loops, Cades Cove is probably the most popular and well known. 3. The wildlife – Great Smoky Mountain National Park is home to a wonderful assortment of wildlife both large and small. Popular animals include black bear, elk, coyotes, boar, deer, and wild turkeys. There is also an array of creepy crawlies like the red-cheeked salamander, which is native to this area and cannot be found any other place in the entire world. The aforementioned driving loops are great places to spot wildlife. I am routinely able to spot black bears along Cades Cove Loop. 4. The wondrous phenomenon of Synchronous Fireflies – During firefly season, millions of Photinus Carolinus fireflies can be seen gathering and lighting in unison for a spectacular night time display. 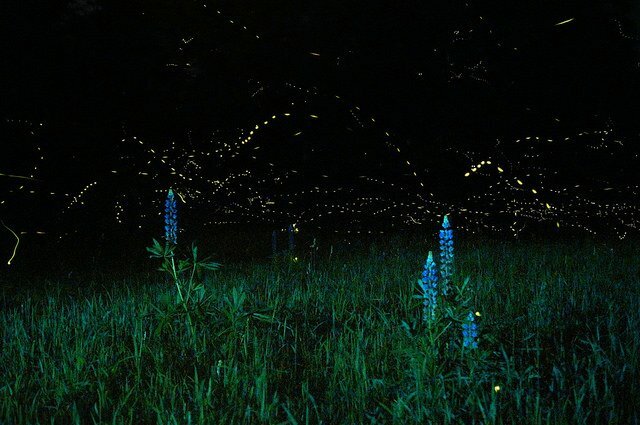 The fireflies are visible from the Elkmont viewing area. Parking and shuttle passes are required. Viewing dates are announced in mid-late April. Be sure to check the National Park Service website frequently during that time, because passes sell out quickly. 5. The hiking – The Great Smoky Mountains are home to over 850 miles of hiking trails. This includes 70 miles of the famous Appalachian Trail. With so many miles of trials, there are plenty of options for everyone, regardless of ability level. Even better, many of these trails lead to gorgeous waterfalls. The largest and most popular waterfalls include the Grotto, Laurel, Abrams and Rainbow falls. Another popular hiking spot is Clingman’s Dome, the 3rd tallest peak east of the Mississippi River. 6. The Camping – The park also offers many different camping options. Frontcounty campgrounds are the most developed and come with popular amenities, such as running water and bath houses. These camp sites offer both tent and RV options. For the more adventurous, there are backcounty campgrounds. These campgrounds are very primitive and require campers to hike for several miles before reaching the location. Horse camps are also offered. Here, campers may bring their horses for riding. The horses must be kept in designated stalls, when not being ridden. 7. The Fishing – With over 2100 miles of streams and rivers, the Smokies are an excellent fishing destination. The park is home to brook, rainbow and brown trout, as well as small mouth and rock bass. Year round fishing is permitted from 30 minutes before sunrise to 30 minutes after sunset. Permits are required in both Tennessee and North Carolina. 8. The History – The park houses over 90 historic Appalachian buildings. The structures include churches, schools, mills, houses, barns and outbuildings. The majority of these historic relics are located along the scenic driving loops. Pamphlets and audio tours are available at select locations. 9. The proximity to Gatlinburg – Gatlinburg is just a hop, skip and a jump away from Great Smoky Mountain National Park. The town offers sweeping mountain views, as well as a variety of restaurant and entertainment options. The area is famed for its 9 mile arts and crafts driving loop, which takes visitors on a tour of local artisans. Gatlinburg is also home to the area’s only aquarium, Ripley’s Aquarium Of The Smokies. Due to the numerous hotels available in every price range, Gatlinburg is a very popular vacation home-base for those families that don’t fancy themselves as campers. 10. The proximity to Pigeon Forge – Pigeon Forge is another regional hub. Just north of Gatlinburg, Pigeon Forge offers world-famous dinner shows, comedy acts and variety shows. There are also many hands on attractions geared towards ever facet of family-friendly fun, including mini-golf, go-karts, interactive attractions and museums. Restaurant offerings are matched to every possible taste and appetite. Shopping is also a popular activity in the area, especially at the various outlet malls. Last but not least, there is the ever popular Dollywood amusement park and its sister park Dollywood Splash Country. Whatever you may be looking for in your next family vacation, you can surely find it in the Smokies.